Tap Forms gives you the ability to perform a variety of commands on forms, records, and layouts. For example, you can delete a form, duplicate a form, share a form template with others, and import a form template you’ve been given by others. You can create new records, delete records, duplicate records. The File menu contains a variety of commands for exchanging your data with others. It contains commands for importing records, exporting records, importing form templates, exporting form templates, importing Bento templates, backing up your database, restoring your database and printing your forms. Other topics in this guide will go through each of these options in detail. The View menu lets you switch between different views. You can switch between the All Forms and My Forms lists of forms and between the Single-Column and Multi-Column records list views as well as the new Photo Grid, Map, and Calendar views. To delete a form, select a form and click the Forms menu. Then select the Delete Form command. When you delete a form, Tap Forms will delete all of the records and all of the photos and files associated with the records in the form. To duplicate a form, select a form and click the Forms menu. Then select the Duplicate Form command. When you duplicate a form, Tap Forms duplicates just the form template, not any of the records. Custom layouts are also duplicated along with the form template. 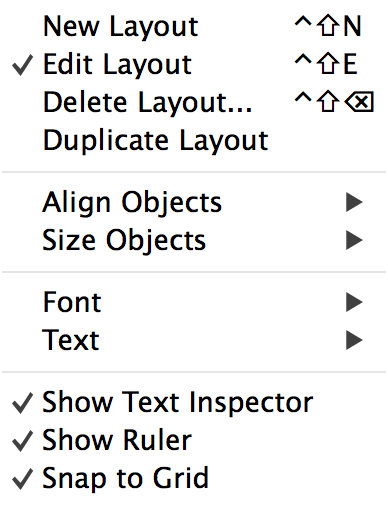 *After you’ve made a duplicate of your form, you will not see the default or custom layouts displayed just yet. To see these views, press the + button on the records list view to create a new record. Once a new record has been created in your form, the Default Layout and any custom layouts that were in the original form will also be displayed. You can also access these commands by right-clicking on the selected form in the My Forms or All Forms list. To delete a record, select a record and click the Records menu. Then select the Delete Record command. When you delete a record, Tap Forms will delete all of the photos and files associated with the selected record. To duplicate a record, select a record and click the Records menu. 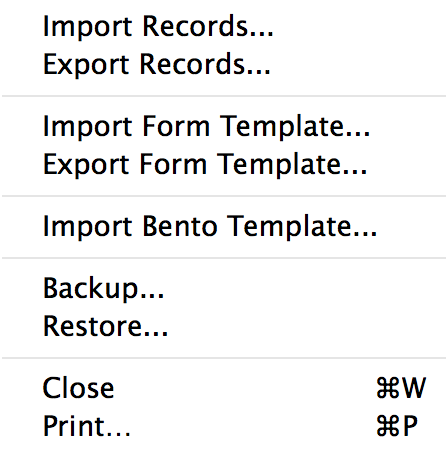 Then select the Duplicate Record command. When you duplicate a record, Tap Forms will duplicate all of the photos, drawings, and audio recordings associated with the record. File Attachments will not be duplicated at this time. You can also access the Duplicate and Delete commands by right-clicking on the selected record. You can use the keyboard to quickly navigate between records. Command-] will move to the next record. Command-[ will move to the previous record. Command-shift-[ will move to the first record. And command-shift-] will move to the last record in your form. The layout menu provides a variety of commands for managing your custom layouts. From here you can edit layouts, duplicate layouts, delete layouts and perform a variety of commands on items in your custom layouts. *The tools menu just gives you an alternate way of gaining access to the Pick Lists and Categories Edit screens.